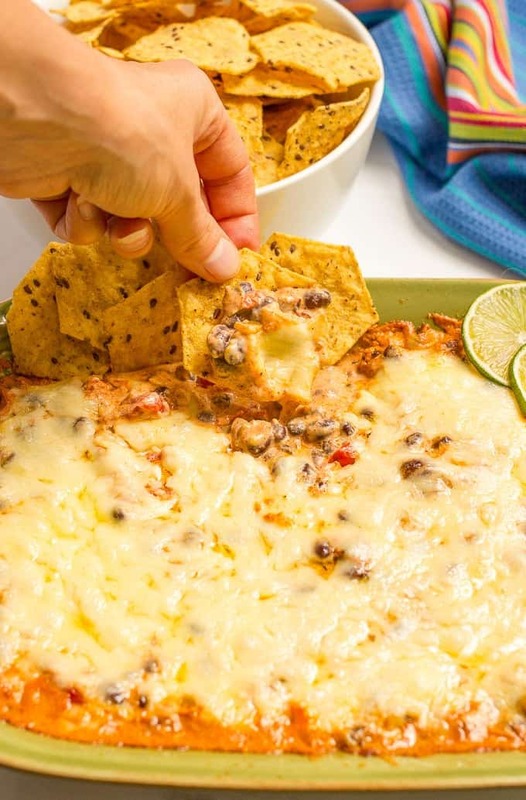 An easy, cheesy black bean dip that’s baked until bubbly and served with tortilla chips for a tasty appetizer! Time is seriously playing tricks on me. Or purposefully trying to mess with my mind. It’s Friday. It’s September. My kids are in their second full week of school. Except it wasn’t even a full week with the Labor Day holiday. I’ve got work projects and requests piling up, we’re barreling ahead into fall (which always seems like a crazy time of year) and this is the last weekend our neighborhood club pool is open. And somehow or other, we’ve made to football season again. On the upside, cooler weather is ahead (and yes, I’m one of those pumpkin crazed people who’s already baking all the fall treats!) and fun Sunday afternoons of having the game on in the background. And of course, football means lots of tailgating, parties, get togethers and all the game day eats! 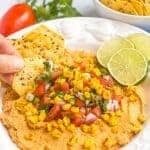 I often bring hummus (like my southwestern hummus or roasted red pepper hummus, both loaded with toppings) or my veggie-loaded pizza dip or easy vegetable squares (an old family favorite). 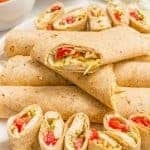 If I want something heathy and well-rounded, I turn to my chicken roll ups with cream cheese and veggies. 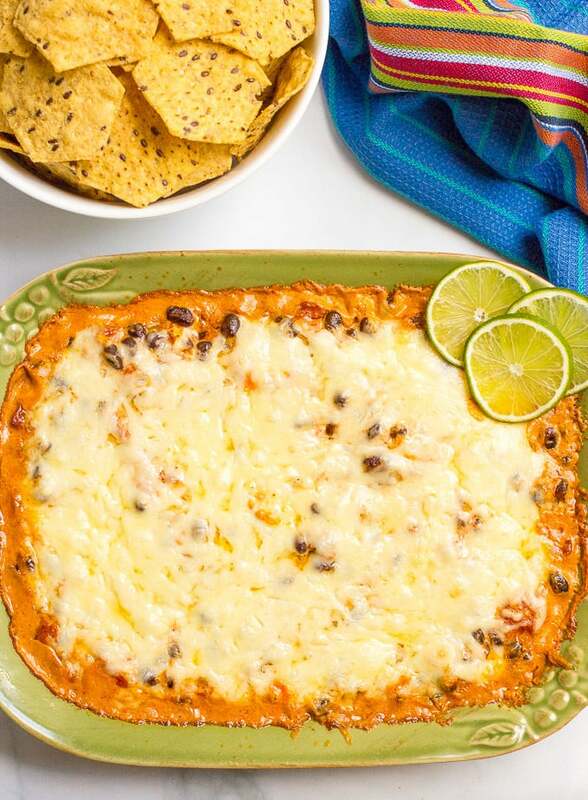 One of my new favorite appetizers to share is this cheesy baked black bean dip. 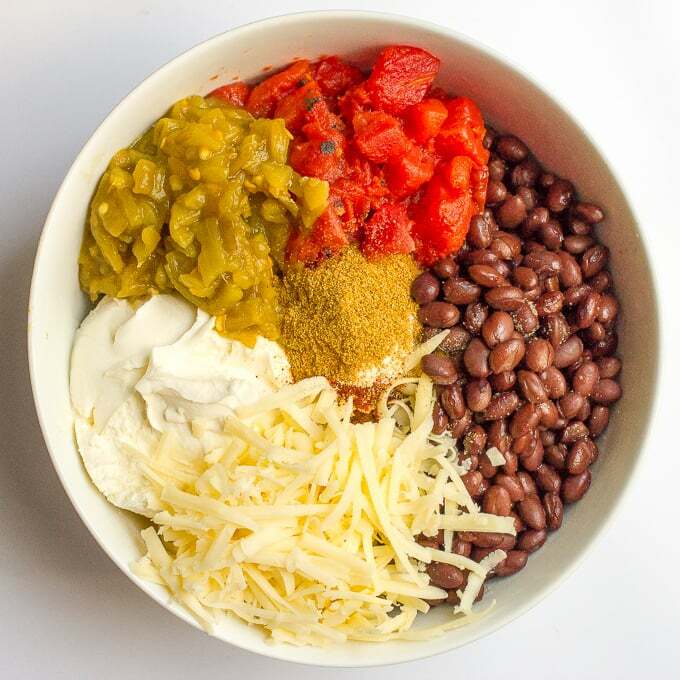 It’s loaded with black beans, tomatoes, spices and of course, plenty of cheese. 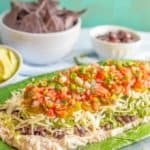 This cheesy black bean dip is easy to prep, with just a few pantry staples, and has hearty, rich flavor. It’s a good one to keep you full and happy through a long game. I made it for a family get together recently and it was devoured! We liked it so much, I made it again later in the week, just to have to snack on. I used can diced tomatoes and a can of diced green chilies, but you could use the can of diced tomatoes with green chilies if you prefer. 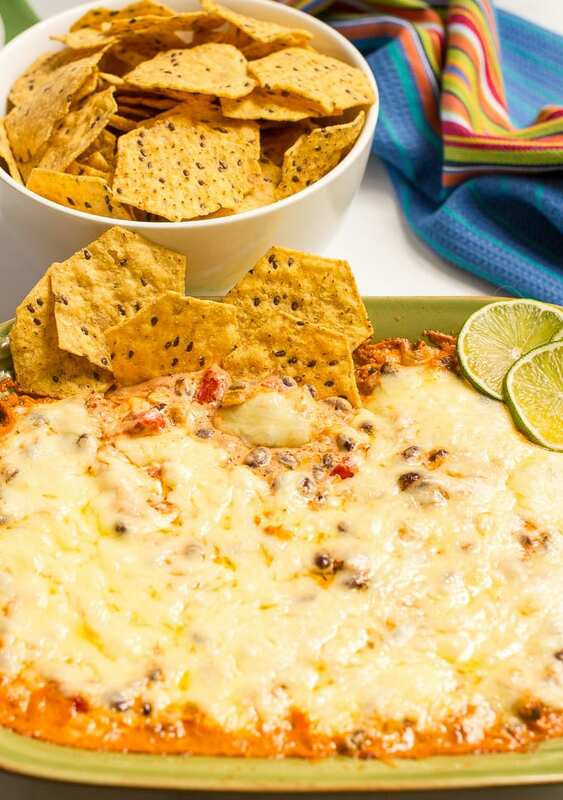 I highly recommend you smash half of the black beans as you make this dip (as written in the recipe below). 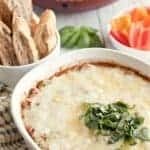 It adds texture to the dip and helps bring it all together, as well as giving it an added creaminess. You can also add a bell pepper, diced small, if you’d like. Any color will do. Or a cup of corn (fresh or frozen, thawed). Leftovers reheat well. I just zap a bit in the microwave to warm up for a quick snack — or topping for chicken or tacos. Ready or not, here we go, head first into fall. And football. 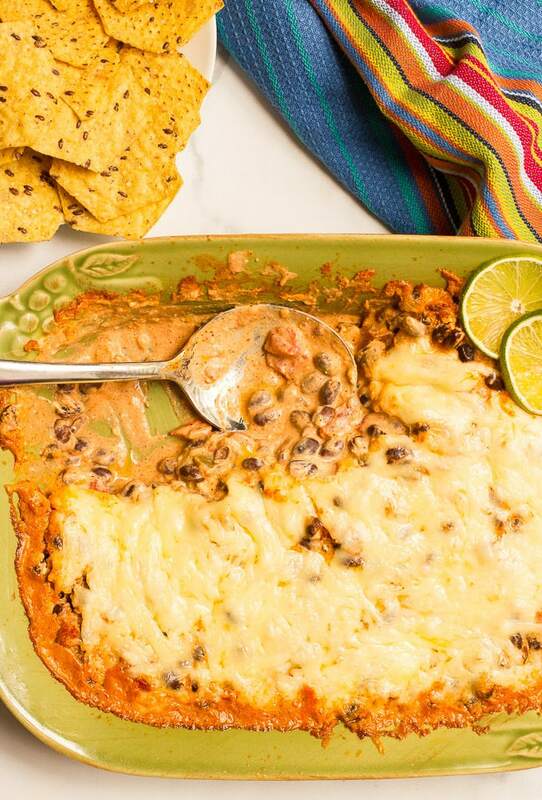 This hot and bubbly cheesy black bean dip is perfect for a crowd! Preheat oven to 375. Spray a 2-quart baking dish with cooking spray and set aside. 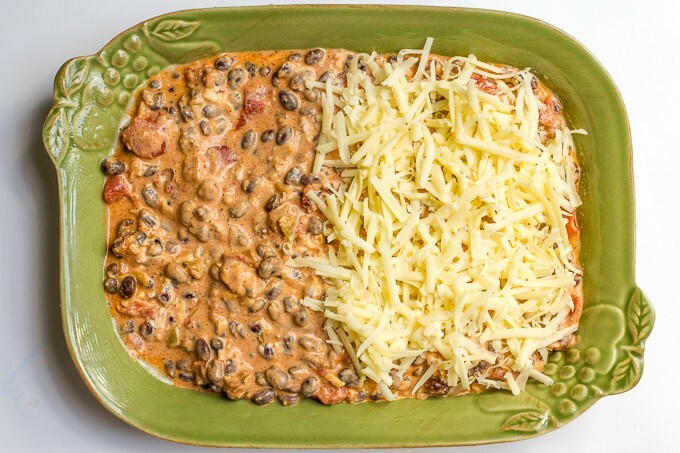 Pour the mixture into the baking dish and top with the remaining 1 cup of cheddar cheese. I used a can of diced tomatoes and a can of diced green chilies, but you could use the can of diced tomatoes with green chilies already in it if you prefer. To make this a bit spicy, add a chopped jalapeño, a pinch of cayenne or a teaspoon or so of hot sauce. 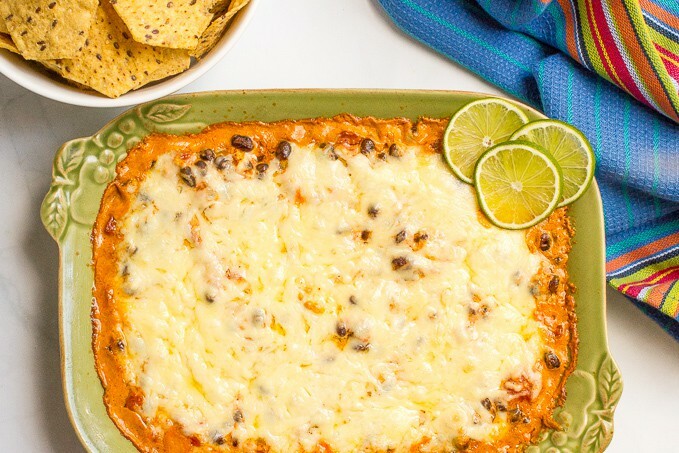 This is the perfect dip for football season! This looks SO SO good! Definitely need to make it for a football watching party! Thanks Laura! It’s gonna be on our regular game day food rotation for sure! Yum! 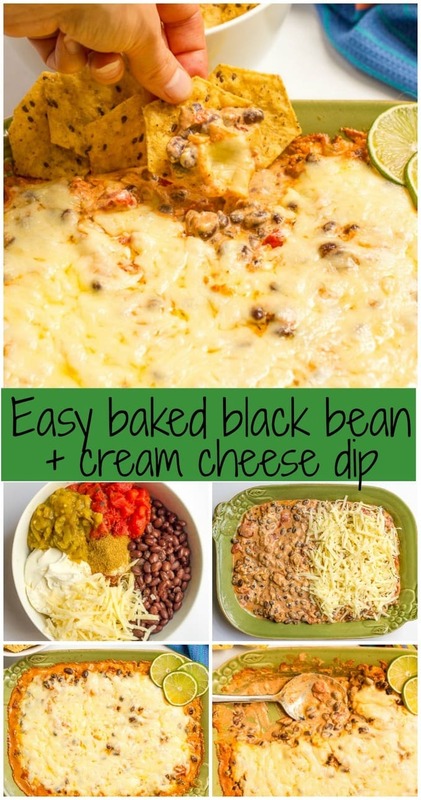 I love a good dip, especially anything with beans or cheese! I hear ya! And this one has both!! Not only is it football season, it is the dreaded overlap between football and baseball. ALL SPORTS ALL THE TIME on my tv now – bring on your cheese bean dip is what I say!! We just made this last night and it was sooooo good! Thanks for the great recipe! We will definitely make this again. I’m so happy to hear you loved it Dan! Thanks for sharing and happy New Year! Love me some cheesy appetizers! 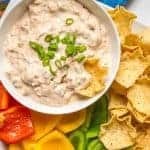 Awesome dip for any occasion!! I’m all about some black beans! Hello from 2019! HAHA! Gotta love the internet! I was looking for a variation of my black bean dip and I think I found it with the addition of cream cheese and using canned tomatoes! 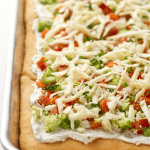 I’ll definitely be adding some onion but otherwise I am excited try this cream cheese version! Yay, I hope you love this with the creamy cream cheese addition!